Who Topped Who In The Mile High Hop Club. The “Mile High City” of Denver, Colorado, played host to the biggest Hop on the 2007 Lowrider Magazine 30th Anniversary Tour schedule to date. When we originally walked into the hopping pit, all that could be seen was about 10 to 12 cars, and the thought was, “Wow, this is going to be an easy show to cover.” Once through the doors, however, we realized that the rest of the guys were inside. 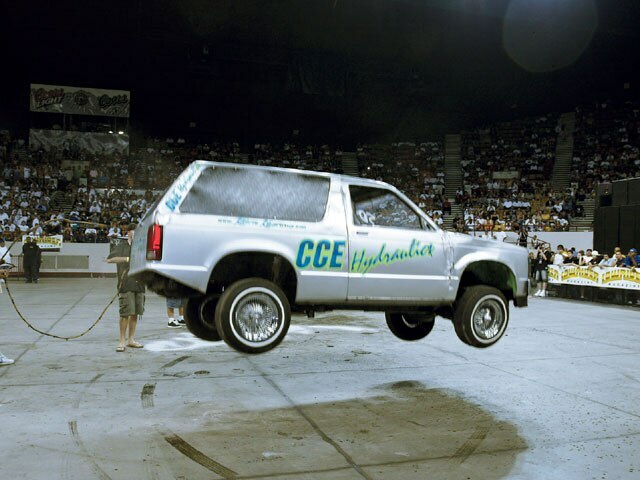 A total of 33 hoppers and dancers registered for the CCE Hydraulics-sponsored event. The cars came from all over the Southwest, plus Kentucky, Washington and even Mexico to compete at the indoor event. Starting off the Denver doings was Antonio Torrez from Mexicali, Mexico, who brought his ’87 Chevy Malibu to kick off the Single-Pump Hop. The candy green wagon hit 24 inches to set the pace. Next up was Denver local Robert Morales Jr. of Robert’s Tires and Wheels, who hopped his ’84 Olds Cutlass for exhibition. Robert had difficulties and couldn’t get his car to work within the required time frame. The Single-Pump Hop was huge with 10 guys registered. Winning the tough class was New Mexico’s Eppie Martinez. His ’64 Chevy Impala reached 57 inches, killing the car’s rear bumper as he smashed it into the concrete for the delighted crowd. Second Place was claimed by Ricardo Sanchez and his ’85 Chevy Caprice from Washington. 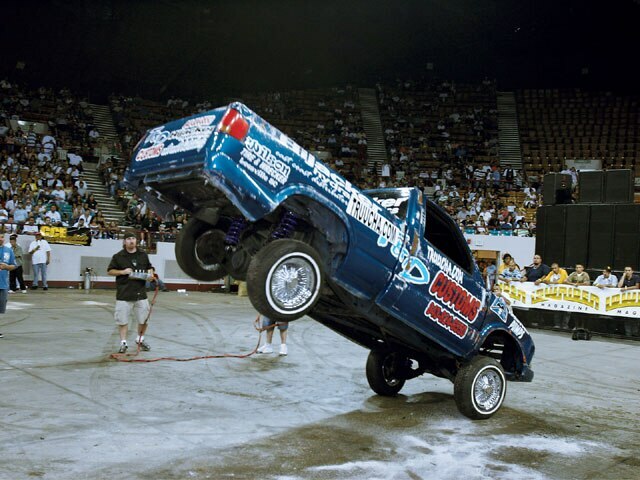 Ricardo was trying to qualify for the Las Vegas, Nevada, Super Show Hop and his car hit 38 inches. Jose Renteria took Third with his ‘80 Buick Regal at 34 inches. The Double-Pump class was equally competitive and at the end of it all there was a two-way split for Second Place between local Christian Cutz’ ’65 Impala and Anthony Vigil’s ’84 Pontiac Grand Prix. 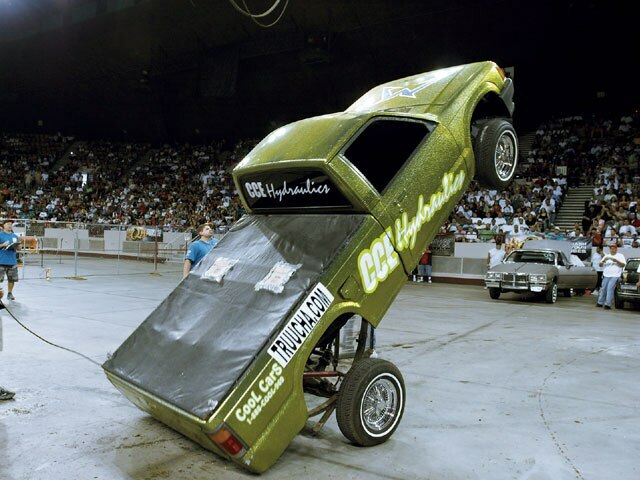 Both of the cars managed to hop 27 inches, which was some way below the First Place mark of 68 inches set by the Black Magic Hydraulics ’86 Cutlass from Las Vegas. This car had the crowd going wild as it pushed its rear bumper into the ground. 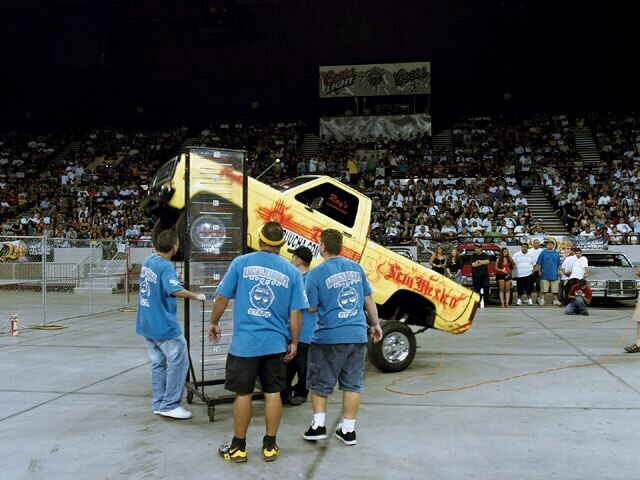 There was more excitement in the Truck Hop with a new record set. First to place was Chris Hernandez and his ’84 Ford Ranger at 32 inches, good enough eventually for Third Place. 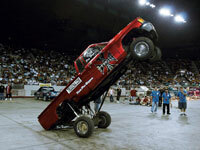 Finishing in Second was Eppie Martinez, who reached 64 inches with his ’84 Ranger. Coming in all of the way from Louisville, Kentucky, was Team CCE with their Cool Cars ’91 Mazda. 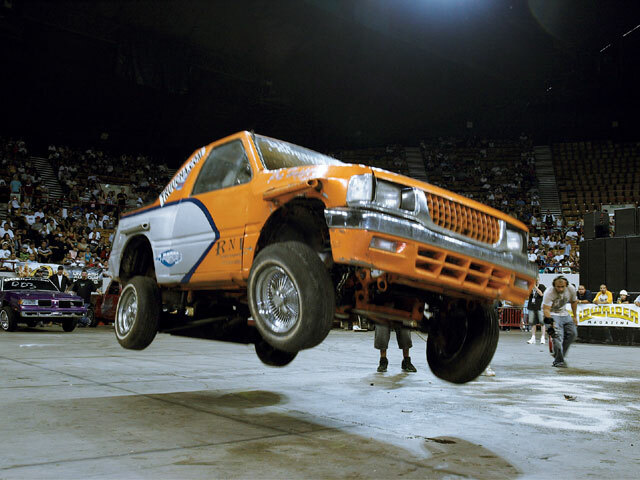 The truck tore it up for the crowd and switchman Bryan Gillespie didn’t hold back, setting a new Tour record of 85 inches in the Mile High altitude. There was another two-way split for Second Place in the Radical Hop. Todd Land and his ’64 Impala convertible and Armando Nunez and his ‘62 Impala went at it and ended up dead even at a very respectable 72 inches. Todd then returned with his ’64 Impala hardtop and showed everyone how he could squeeze out another 10 inches before scraping the rear bumper, winning the class at 82 inches. With the hopping portion of the competition complete, it was time to dance. First, in the Street Dance, Marco Lujan of El Paso, Texas, danced his ’87 Mazda to the beat of 18 points, nailing down Third Place. Rob Robertson secured Second when his ’93 Isuzu Amigo scored 26 points. 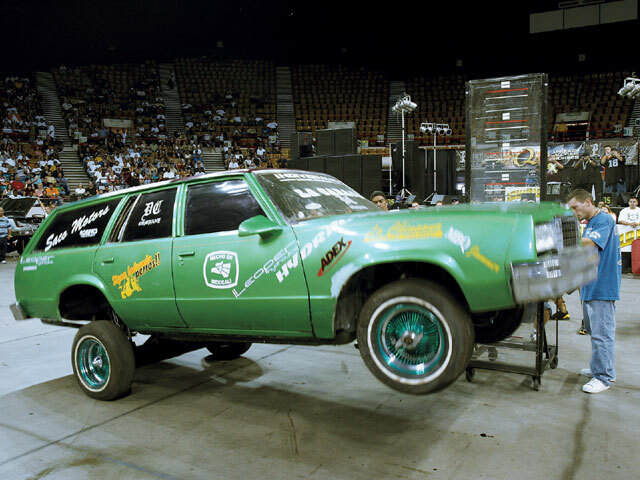 First Place went to Travis Piper and his ’91 Chevy Blazer, which rang up 27 points thanks to some powerful moves. The climactic Radical Dance was full of suspense as nobody wanted to be left out of the action and the scores reflected the level of competition. The lowest score of the day was 25 points, which went to Rob Robertson and his ‘90 Blazer. That would normally be enough for a “money spot” but not on this day. Team CCE hit the switches on the T&D Customs’ ’97 Chevy S-10 and tallied 26 points to squeeze past Rob and eventually Third Place. Second Place went to Clint Perkins with his ’80 S-10 that scored 28 points after doing all of the moves. 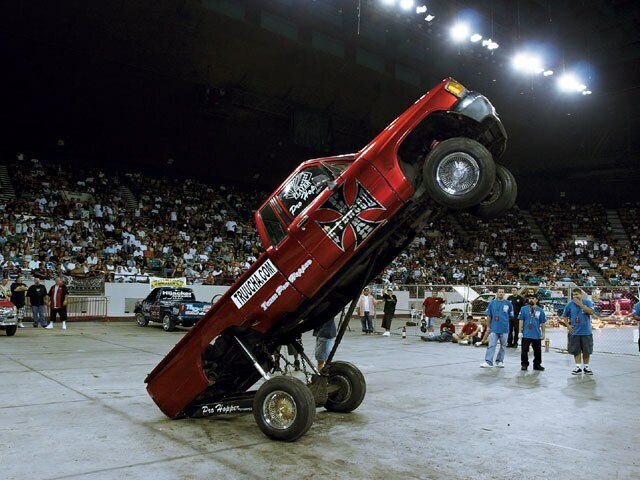 Usually, they say that truck dancers have an advantage over cars. Well, not in Denver. Team CCE danced their ’87 Cutlass to an almost perfect score of 30 points. This radical dancer was the first car to lay on its roof this year and it kept going after they flipped it back over, raising the roof off of the building as it finished the required time of 75 seconds to end the hydraulic competition. Team CCE seemed to dominate the Denver Tour stop Hop, but there are still three more shows to go before the grand finale in “Sin City.” We can’t wait to see what these shows bring as nobody’s holding anything back and everyone’s giving it their all.